If you’re looking for your daily dose of inspiration, look no further than Alan Greer. A year ago, Alan weighed over 300 pounds and hadn’t run a mile since high school gym class. But with a lot of hard work and willpower, he just accomplished something incredible: Not only did he drop 150 pounds to run in the 2016 New York City Marathon, he gained it all back quick enough to tear it up during cannonball season! Talk about mind over matter! 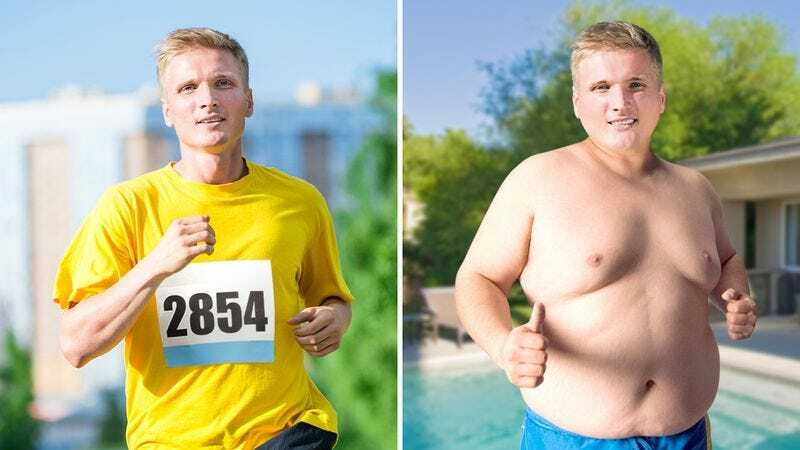 Starting by jogging just half a mile a day, Alan trained and dieted for nine months to undergo the incredible transformation that cinched him his impressive 3:20 finish time. And when he’d crossed the finish line, he immediately switched over to an all-carb diet that piled the pounds back on, rebounding back to his original 315-pound weight just in time to perform geyser-inducing jackknifes into his local pool. Alan’s become a bit of a local celebrity for his incredible story and unbelievable splash radius, and with cannonball season in full swing, he’s regularly running into fans at his neighborhood public pool. Though he loves the cheers he gets after his hard-earned massive frame displaces torrents of pool water, it’s hearing stories of how he’s inspired people to reach their full potential that he really loves. Well, that, and a bombshell off the high dive! So what’s next for Alan? He has plans to slim back down for a Tough Mudder race in September, and then jack his weight right back up to three bills again to compete in a local Halloween pumpkin pie–eating contest. It’s an ambitious schedule, but Alan has shown that he’s not to be underestimated. Good luck out there, Alan! Whatever you set your mind to, we know you can do it.